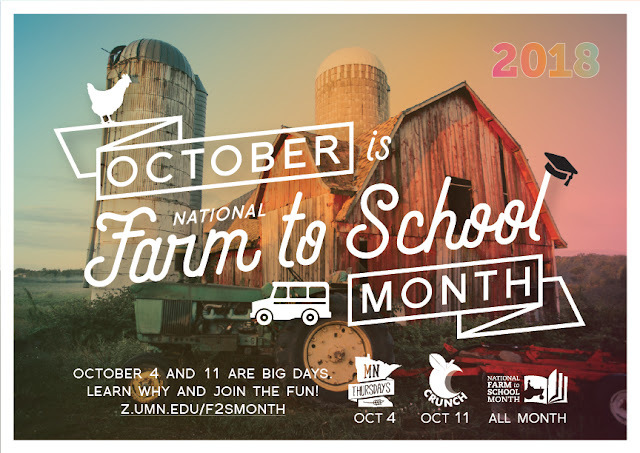 October is National Farm to School Month! This is a time when University of Minnesota Extension and statewide partners recognize the importance of farm to school practices as a way to improve child nutrition, support local economies, and teach children about where food comes from. Farm to School events and “Legislator to Lunch” visits are taking place across Minnesota during the month of October. Here are two upcoming events. Minnesota Thursday — Thursday, October 4 — Schools across the state will kick off National Farm to School Month and celebrate the power of procurement by serving a healthy, locally sourced lunch tray. Great Lakes Great Apple Crunch — Thursday, October 11 — Schools and organizations across the Great Lakes region will crunch into a local apple at noon, local times. Those that register by October 2 will receive FREE Crunch stickers and a chance to have Minnesota Timberwolves Mascot Crunch lead their crunch in person! For more details on Farm to School Month opportunities, visit Extension’s Farm to School Month page. University of Minnesota Extension and Minnesota Department of Health co-convened a statewide Farm to School Leadership Team in April 2011 to move the farm to school agenda forward in Minnesota. Since then, Farm to School partnerships have flourished in Minnesota. According to the 2015 USDA Farm to School Census, 268 school districts in Minnesota participated in Farm to School practices in the 2014-2015 school year. This is up from 18 in 2006 and 145 in 2011. For more information on Farm to School in Minnesota, visit About Farm to School.